I enjoy the ease of searching the internet, reading blogs or articles, and following through the hundreds of Pins I have on Pinterest. But really for me nothing quite compares to sitting down with a book and learning about the subject matter that interests me in the moment. 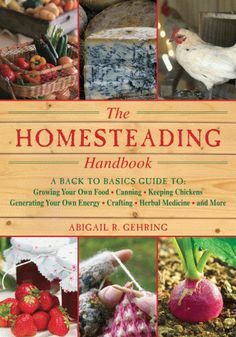 Currently my new favourite read is The Homesteading Handbook written by Abigail R. Gehring. I have only had the book a couple of days and already I am inspired and excited about all the things I can put into practice over the next year. From gardening, to chickens, canning, and the dream of a milking goat/s (shh). It also included many things that haven’t crossed my mind as an urban on the grid (married to a Network and Server Administrator, we are never giving up cell phones and internet) girl, like solar energy, geothermal heat/cooling, lessening our carbon footprint sounds good to me! I enjoy the text book layout of information, with colourful pictures, general overview of each subject included, and helpful tips sprinkled throughout the pages. It has been a great resource keeping me focused on gardens and summer harvests despite the cold snow we woke up to this late April morning. I know this will be a book I refer back to many times as we try and shift our family towards a more self-sufficient lifestyle while living in town, on all town services. Garden and chickens this year, repeat “Keep it Small Amy-Lynn“. I am excited, and when I am passionate about a new project well, I jump both feet in and don’t look back. This however, is a lifestyle change and it will definitely take time to learn and adapt a new way of being. Have you read this book, or do you have another great resources you could share with us? I would love to hear your thoughts or maybe you have plans to adopt ‘homesteading’ (okay, really I know what I am doing is not homesteading, but Joel is a big fat NO on that idea) into your everyday life? Either way I am totally interested in hearing from you, and sharing the journey with you! Before Eric was born I did a ton of canning, hoping to get back into it this year if you want to do some together, or just need any books, I’m your gal! Yes I do! Joel was just mentioning today that we better be prepared to do a ton of canning with all the tomatoes I have ready to plant! Our apple tree also does a pretty good harvest for sauce, lots of peeling though!!!!! I love that you are into it too.